We all know the advantages to new construction: pristine fixtures, fresh surfaces, warranties, and is, usually, a blank slate begging for some personality! With so many options out there for dressing a home, many wonder where to start. Well, why not the walls…they are the background to everywhere the eye falls. Sure, pictures and paintings offer pops of color and personality, but how about the actual wall… and not just the color; what about the composition of it? “The composition of the wall?” you may ask. Yes, the composition. How about a concrete feature wall? That is exactly what a homeowner in Houston, Texas requested. Wanting the perfect gray concrete feature wall to surround their fireplace, the homeowners called on Spencer Lippincott with All Out Construction of Houston, Texas to fulfill their ideal. Spencer and his team began by removing the fireplace frame and taping off the area. The preparation included the application of a moisture vapor shield (like SureCrete’s Elasto-Shield) onto which sand was thrown to provide tooth for the basecoat to hold on to. 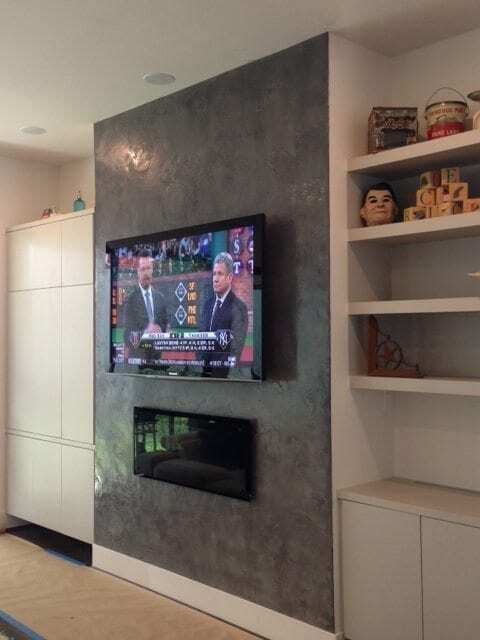 A dark colored basecoat of SureCrete Design Products’ Wall Spray was troweled onto the prepped surface followed by a lighter colored topcoat to achieve the homeowner’s “ideal” gray. The Color Packs added to the Wall Spray are available in a variety of colors and can be combined for whatever may be your “ideal”. The concrete was built up to about 3/8 inch and was polished up from a 100 to a smooth 400 grit finish. SureCrete’s Super 30 Acrylic Concrete Sealer was rolled on to protect and enhance multi-tonal features on concrete surfaces. Spencer incorporated metallics to the sealer to add further dimension and brilliance to the finished feature wall. So, think beyond pictures and paint to add personality to your home…think of a polished concrete feature wall – in YOUR ideal color.